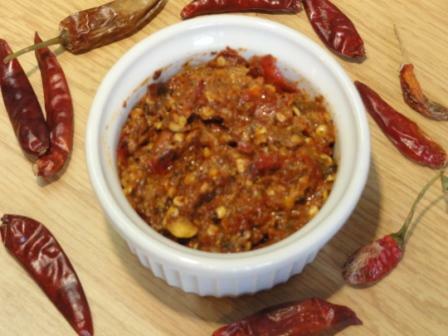 Harissa is a hot and spicy Tunisian condiment and can be stored in your fridge for up to six months. Use it with caution as it is very hot! We love it and always have a jar in the fridge. I love adding some to scrambled eggs for a real wake me up! Hi Tandy. I love North African cooking and condiments, as you may see from my blog and style of cooking. Would love to give this a try- my chilli crop has thinned out. Going to see what I can get at the stores. Thanks for this. it keeps for ages so it is great to have in the fridge for those winter days when chillis are out of season! Hmm, not sure my palette will handle this. I do love the combination of ingredients though. Wonder if I could reduce the amount of chillies – do you think it will work?